From camps, to field trips and special “engineering days,” OUSECS has a variety of outreach programs to get children and teens interested in engineering and related fields. 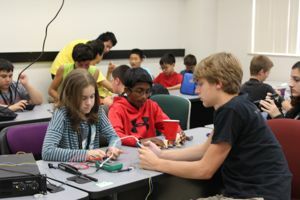 The hands-on activities started about 4 years ago, when the school started offering general engineering and computer science exploration summer camps. A relationship began with Pontiac Schools, and gradually, camps expanded from general exploration camps to more focused programs. After positive feedback from the parents and kids, the camps have expanded greatly — providing more options and facilitating an increase from 100 to about 700 attendees in the summer alone. “From mid June to mid-August, the students are here all day, everyday,” Kobus said. STEM camps take place on OU’s main campus, the OUInc business incubator and the Macomb County satellite Anton Frankel Center. OU engineering undergrads and other local engineering students lead the camps, instructing the hands-on activity, which they plan with direction from Kobus. While the camps benefit the community, they also help the program grow. With jobs increasing in the engineering field, more graduates are needed, so gaging students’ interest — and indulging and encouraging them in those interests early on — is crucial. Science, Technology, Engineering and Math (STEM) camps focus on hands-on, project-based learning. Students have the opportunity to apply material and themes to real-world situations, through experiments and projects, for a unique learning experience. Noelle Rossetto, who is home-schooled, found out about STEM camps from her sister. Attending them was enjoyable for her, and the work she did made her more interested in engineering and computer science. Abby Schreck, 11, and Nate Schreck, 9, both took part in an Engineering Exploration week and had a great time learning new things. Kobus said the camps have continued to grow, and in turn, have boosted enrollment in the OU Engineering and Computer Science Programs. He said he plans to continue adding more outreach programs each year — from STEM camps to field trips and visits to schools — because of the positive effects they have on everyone involved. For more information about the outreach program, visit oakland.edu/ouinc/outreach.